Fu Biao is also called as Fu Xingzhong, who acquired a master degree. His home town is County Kai, Congqing City. He is a contemporary young poet, calligrapher, Chinese martial artist, educationalist, social activist, speaker, and Chairman of the board of the Global Kungfu Science & Technology Group, which possesses mass media of website and magazine, and many entities of corporation ranging over the culture of film and television, performance and communication, advertisement, garment factory and so on. It also set up nine schools of martial art in Beijing, Shanghai, Hebei, Shandong, Nanjing, The UK and Ukraine. The total number of students is more than six thousand. Fu Biao undertakes the proprietor and chief editor of the Global Kungfu Magazine Company, CEO of the Global Kungfu Website, chairman of the expert committee of the Global Kungfu Website, general president and general coach of Beijing Shaolin Martial Art School, the board chairman of Beijing Book & Sword Science & Technology Group and Shanghai Xingyin Culture Communication Ltd. Company, the president and general coach of the Branch School in Songjiang, Shanghai, North China Martial Art Branch School, the First Campus and the Second Campus of Beijing Shaolin Martial Art School, and Beijing Daxing Shaolin Martail Art Institute. He is vigorous and fond of social affairs. Commissioner of Beijing City Young Joint Commission, Chairman of Beijing City Vocational Education League, vice-president of Beijing Primary and Secondary School Association, commissioner of Chinese Wushu Federation School Advisory Committee, deputy president of Beijing City Teenage Education Association, associate secretary-general of Beijing City Martial Art Association, commissioner of Changping District Advisory Body, vice-chairman of Changping Young Joint Association, vice-president of Changping Poem Association are all his social title. Fu Biao have been awarded as the Hundred Excellences of the Fifth China Reformation, the Ten Preeminence’s of the Sixth China Reformation, the Ten Influences of the Fifth China Era, the Star of Reformation – Thirty Persons, Thirty Years - the Forerunner Influencing China Reform, the Ten Innovates of the Eight China Reform, the nomination of Sixth Beijing Ten Preeminent Young, the Beijing City Excellent Educators, the Ten Excellent Young of Changping District and so on. He compiled a series of books of Beijing Shaolin Martial Art School - Teaching Materials for Universal Use, a series of CDs of Classic Style Forms of Beijing Shaolin Martial Art Schools, a picture book of Chinese Gong Fu and so on; he also plotted original large-scale stage plays of Gong Fu, such as The Monkey King Uproar In Heaven, Five Thousand Years of Chinese Gongfu. He learned martial art from an early age. 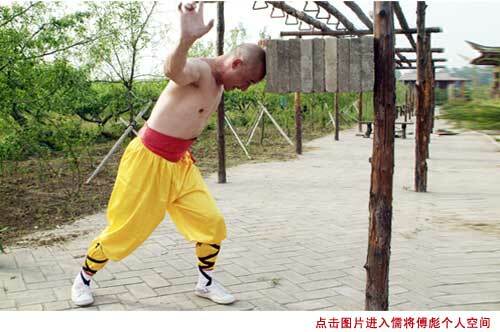 At first he was an apprentice of Wang Lishen who is an experienced boxer in Anhui, and then he became a profane apprentice of Shi Yongxin, the abbot of Temple Shaolin. During this period of time, he was pointed by a deceased famous martial artist Mr. Gu Youyi who was an international judge of martial art and chief editor of the original Shaolin and Taiji. After that, he studied in China Martial Art Research College. He has excellent gift of martial art and is called as “the prince of iron head” for his accomplishment of iron head（铁头功 tie tou gong）. 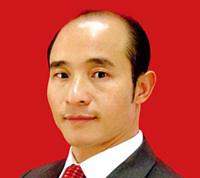 He is a prodigy of learning and versatile, who successively graduated from China Calligraphy University, Marxist-Leninist College of Beijing University, and Capital Economic & Trade University. He is fond of writing poems and handwriting. Maybe for his good skills of martial art, all his works are majestic, irrepressible and big bold, and his style of handwritings is vigorous and brilliant. He deserves the name of genius of civil and military. His works of calligraphy were awarded the Gold Award in the Young Team from the fourth China Art & Calligraphy Works Contest of Grand China Cup, and he was bestowed the title the elite of Chinese Painting and Calligraphy. He also acquired the First Award in the Painting and Calligraphy Team of Returning Cup Painting and Calligraphy Contest in the Fifth Hong Kong International Martial Art Festival, and his works of Martial, Dragon, and Divinity were collected by the Collection of Chinese Historical and Contemporary Calligraphy. He walked alone in the world from nine years old and adventured everywhere. He moved the benefactor by his heart of zeal and acquired unique skills by paying four visits to the cottage of famous master; he entered into Temple Shaolin for three times and been known by a combat in the contest of Zhongzhou Arena talking down to the others. Although two hearts love each other they were separated at last and the affairs happened at Shallow Lake Baiyang was a sorrow in his heart, where he built up the great cause. He went alone to Mountain Tian with the sword, and performed dodge during the cliffs which is amazing to all the people. He made the territory stable by gaining arrows in the water. It rained before dawn which delights my family. The time lightning happened when winds and clouds were wanted. The sky is a bosom friend of Xingzhong, in which the rainbow bridged. It conquered the world by eight thousand students. From then on, his cause moved smoothly and more and more flourishing. The scale Beijing Shaolin Martial Art School is wider and wider, and its influence larger and larger by the development of several years, while the other martial art schools were closed down one after another. It possesses seven branch schools in China and two overseas which have been on the way of collectivize schools. He is not only good at running schools, but also has special ideas in the field of management of corporation. He created five companies successively which set foot in many industries including production of film and television, culture performance, advertisement, website and so on. He is the chairman of Beijing City Vocational Education Association, with his courage to innovate and boldness to reform which develops to an advanced physical education organization rapidly. Fu Biao possesses good skills of martial art, excellent literary grace, lofty moral and unique courage, and is the model of contemporary young men establishing a business to learn and follow. He is generous to the young who come to learn from his successful experience, and let them know every detail of them. Usually universities and corporations invite him to speak about science of success, and he never need a note and often speaks for one to two hours, which is popular with the listeners. “I am an ordinary man. Though I am not seven feet high, I have broad breast and lofty ideals. People name me the Putin in China, a bucket head in the world of literature and a gentleman in the field of martial art. I observe the world and realize that love ends at money and true love is nearly perfect. But I hope there is a person who has the ability to identify my talents and the friendship is evergreen.” It is Fu Biao, short temper and good disposition, who is a great and true man. Martial art originates from China, while belongs to the world; it is attributed to sports but overtops sports. Chinese martial art, which is famous for Shaolin Kung Fu (in Chinese it is called Gong Fu) in the world, with a long history behind it, is extensive and profound. The Executive designer of reform and opening up, Deng Xiaoping, put forward the policy of relying on science and education to rejuvenate the nation, and as a result, the quintessence of our country, represented by martial art, including traditional Chinese painting, calligraphy, Beijing opera and so on, rise rapidly and develop vigorously. The martial culture takes up an significant status in the national and international culture market by its unparalleled connotation and charm, and bring out an upsurge of learning martial art in the seven seas. In the era of cold weapon, the function of martial art was particularly important. Nowadays, human beings step into the high-tech age, martial art still has tremendous charm. With 5000 years of drilling and practice in Chinese history, martial art has got more profound culture connotation rather than simply skills for attack and defense or physical fitness. Taking advantage of various body language and intuitional expression forms, it impresses the peoples and transfers Chinese culture and civilization to the whole world. Chinese martial culture, with its all-embracing character, contains multiple knowledge, which including political economics, military science, diplomatic protocol culture, as well as sports medicine, art of attack and fighting science, body linguistics, aesthetics, philosophy, mechanics, etc. It can be regarded not only as one beautiful name card for the exchange and communication between China and the world, but also a main force of Chinese traditional culture advancing into the international market. According to the theory “evolution by natural selection, survival of the fittest” of Darwin, I bring forward the theory of “evolution by natural selection, survival of the mighty” and “evolution by natural selection, survival of the strongest”. There “the mighty” and “the strongest” refer to viability and competition power. To exist and develop, we not only have to adapt, but also need strong viability and competition power. Only with these competence can we get chance to develop and strengthen ourselves better. Take flocks and herds to illustrate this point. On the huge grassland, flocks and herds accommodate themselves to the circumstance well, but when they encounter tigers, it is their destiny to be eaten, for their viability is weak. Therefore, no matter animals or human beings in the nature have to strengthen their competence and power in order to exist and develop in the competitive society. As to martial art players, those who excel in martial art will possess formidable viability and can knock down the rivals in arenas. This is the principle of survival of the fittest. According to my learning and practicing of literacy and martial art in these decades, I have summarized that “who is fond of civil and military is bound to pursue it in his whole life without relaxation; only in this way can he exceed the other heroes.” Our country has to be mighty, so do our race and people. By practicing martial arts, we can cultivate our taste and hone our mental toughness, we can inspire ethos and change our spiritual outlook, and ultimately we can grow stronger and more powerful. Practicing martial art is training one’s spirit and vitality, in Chinese which is called Jing, Qi, Shen. As long as one lives, he should have some wishes and goals as his spiritual drive, which guides him to the peak of success. There are all sorts of trades, and every trade has its own skill and art, or called Gong Fu. Singing and performing musical instruments needs Gong Fu; writing poems and practicing handwriting needs Gong Fu; so does architecture. For example, the Imperial Palace and the National Stadium (the Bird’s House) in China, Pyramids in Egypt and the Eiffel Tower in France, all these amazing buildings embody high technique and level of architecture design of human beings from the ancient to the modern times. Gong Fu plays a particular outstanding part in martial art. It is known that “Gong Fu is the fruit of time and sweat.” While there is another old saying, “With enough time to practice, one can grind an iron bar to a needle. With thousands of training and hammering, the motto is carved in the heart.” Martial art practitioners should hone the mental toughness, improve the quality of Gong Fu and spiritual minds in order to become a competent successor of martial art. As a martial art practitioner, one’s good skills do not mean he can do anything he wants. The practitioner should firstly obey to the morality of martial art. As the proverb goes, “learn courtesy and morality before learn martial art.” Confucius proposed that to govern country with courtesy, and to play politics with morality. Jiang Zemin insisted to ruling the country by virtue, too. The General Secretary Hu Jintao advanced “Eight Glories, Eight Shames” as the standard of conduct to create a harmonious society. Neither a country nor an individual can establish itself without morality. In fact, a martial practitioner without morality will bring harm to the society. The courtesy and morality of martial practitioners is firstly presented by their modesty and generosity. I summed up that the highest ideal in martial art practice is self-surrender. Martial art practitioners should not only have lofty moral sentiment, but also hold science knowledge and culture, to build up correct conception about life, value and world. Only in this way, could he become a real warrior, and serve for the country and make benefit for the society with his martial art. 2008 Beijing Olympic Games provided an unprecedented opportunity for the development of Chinese martial art. Though at that time martial art appeared only as a special competition item in the Olympics, it strode forward into the door of Olympics. In addition, the great influence of Olympic economics will definitely push forwards the industrialization and marketiztion processes of martial art into a new stage. “To win the world by the charm of martial art” is the ideal of every martial practitioner. To realize this dream, and promote Chinese traditional culture throughout the world, we need to refresh the culture of martial art, increase its charm, and at the same time, popularize the reputation of martial artists and elevate their social statures. I hope that the Global Kung Fu website and the Global Kung Fu magazine will become a platform for the exhibition of Chinese culture, and then pursue the ultimate aim of winning the universal market. Let us stand in China and scan over the global! In the integration of the global economy, we should take up global consciousness, vision, and overall attitudes, orientation to construct the Global Kung Fu website as a publicizing stage for Chinese and the world culture. Let’s make efforts together to build the most profound, most distinctive, most charming as well as most authentic website on Gong Fu!